The energy market in Australia has changed considerably over the past several years. As a growing number of energy retailers offer services in each state, the increase in competition has the potential to offer huge savings to customers with discounts on usage rates. At the same time, wholesale electricity prices are on the increase. The closure of aging coal-fired plants and poor investor confidence has seen huge fluctuations in the price the average home and business ends up paying for their energy. Over the past ten years, the average price of electricity has doubled for users that don’t shop around. More recently, the forecasts look more promising with some states even showing a reduction in the cost of electricity (when adjusted for inflation). Consumers want to know why they are paying so much for their power when increased competition should be offering huge savings. While it helps to understand your individual electricity bill and energy usage, the price of electricity also depends upon the energy market. On average, the amount Australians pay for the household electricity is made up of between 40-55% network costs (the cost of maintaining the transmission network), 40-50% wholesale and retail costs (the charges associated with buying electricity), and between 5-15% of ‘green scheme’ initiatives (the costs to develop renewable and sustainable energy). The electricity network is different in each state. For individual information about the electricity market in your region, Electricity Wizard has specific advice on comparing rates in your state. A report by the Australian Energy Market Commission found that while most consumers are aware that they have choice of electricity providers, only 30% of Australians actively investigate the range of energy retailers offering services in their area. That’s a huge 70% of homes and businesses that are probably paying the expensive standing offer rather than negotiating for a discount or comparing retailers to find the cheapest market rate for electricity. 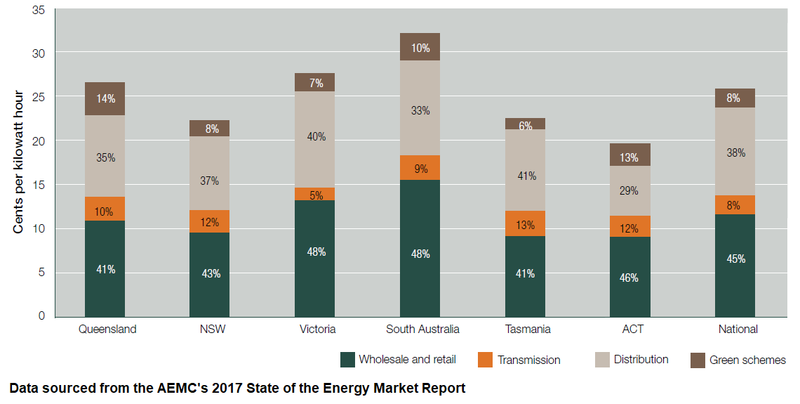 Of those households that had chosen a lower market rate when deregulation first came into effect in their region, 50% of Australians have not switched energy retailers in the past 5 years. It is highly recommended that both homes and businesses compare electricity prices each year to make sure they remain on the cheapest plan. 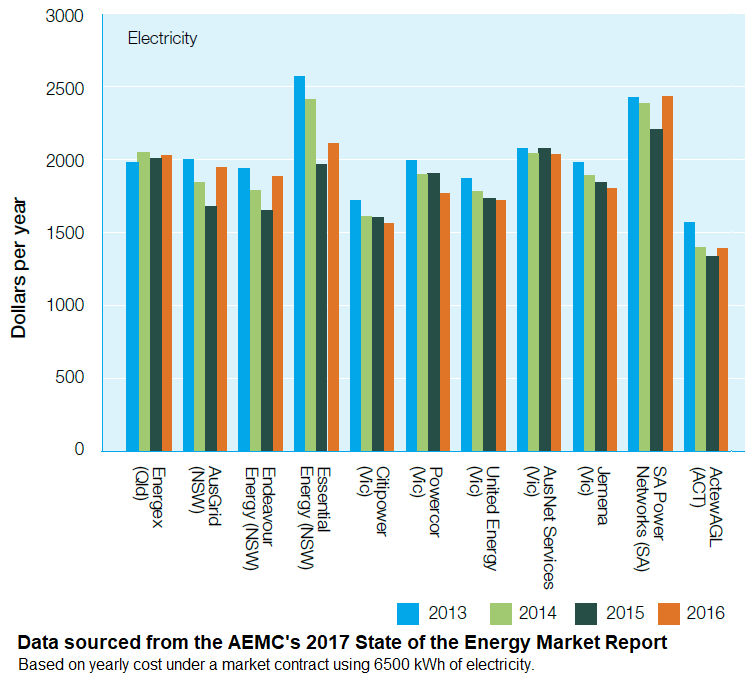 For homes in Victoria, the Australian Energy Market Commission estimates that the discounted market price offered by an electricity retailer is, on average, 17–22% lower than that same retailer’s standing offer. Consumers are paying too much simply because they are not actively looking for a cheaper price for their electricity. Most people don’t have time to phone around and research all the different electricity and gas retailers in their region. If you want to find out who has the cheapest energy prices near you, with just one phone call Electricity Wizard can compare your current electricity bill to find you a cheaper rate with a company that offers you the customer service options you need. At Electricity Wizard, we do all the hard work for you. When you call us, we’ll compare your current rate and plan against the best electricity suppliers available in your area. We’ll compare kilowatt per hour costs, supply charges, as well as any special rebates and discounts that might apply. Then we’ll help you select the right plan so you can start saving money! The best thing is our service is completely free! If we can’t find you a better deal, then you can remain with your current provider. If you switch and are not happy with your new retailer, we even offer Exit Fee protection. You’ve got nothing to lose! Call Electricity Wizard now on 1300 359 779 or fill out your details below to have one of our comparison specialists help you get a better deal on your energy bills today!